OAKLAND -- While most shoppers were focused on door-busting deals at retail outlets, a few kicked off a different kind of shopping season by buying Christmas trees from the Oakland Lions Club Friday. OAKLAND — While most shoppers were focused on door-busting deals at retail outlets, a few kicked off a different kind of shopping season by buying Christmas trees from the Oakland Lions Club Friday. 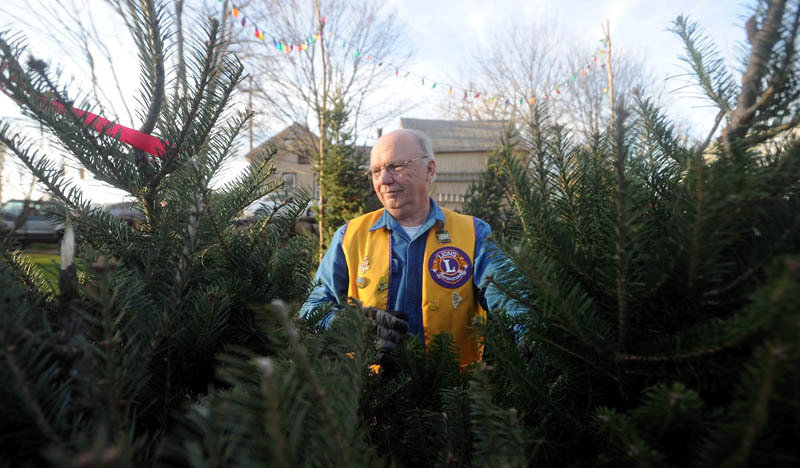 Coordinator Ray Watson, 60, said the club hopes to sell 450 trees out of the lot on Kennedy Memorial Drive and spend the proceeds on a brighter Christmas for 30 disadvantaged children. While only two trees had sold by mid-afternoon, Watson expressed confidence that sales would pick up over the weekend. In the 20 years Watson has been selling trees for the club, he said he’s come to think of shoppers as coming from one of two different groups. The trees retail for between $15 and $40. Some of trees have bird nests in the branches, he said. “I tell people that I should charge them extra, because those are lucky trees,” he said. Watson said the money pays for a Christmas dinner for Oakland children who have been chosen based on the financial hardship of their families. Each child is given a set of winter outer gear, an additional clothing item and a toy from Santa Claus, who will also be present at the tree sale lot every Saturday. Watson said that the club increased its inventory to 450 after last year, when all 400 trees sold with two weeks to go before Christmas. Watson said that he has come to enjoy watching the tradition of the Christmas tree sale unfold as family after family comes to visit the lot and make a selection. While both parents are usually present, Watson said neither mother nor father generally picks the tree that is ultimately purchased. “The kids always choose, it seems like,” he said.